Prof. Usha Dodmise, kiran Lagashetti, Balchandra Ganji, Rakesh Kompelli and Pradeep Gaikwad. "RTO System for QR Scan." 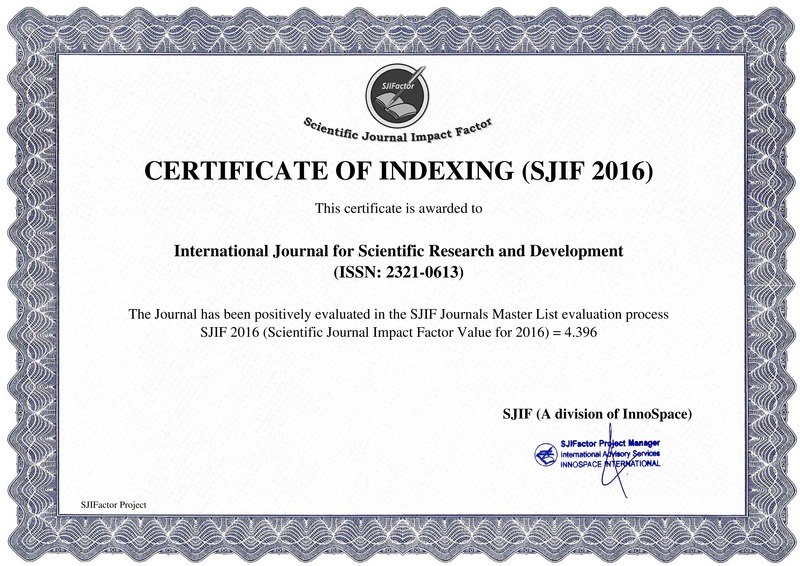 International Journal for Scientific Research and Development 7.2 (2019): 726-730. -Thombare Yogesh Ramdas	; Shinde Amol Bhausaheb; Jadhav Aditya Chandrakant; Aher Lalit Rajendra; Prof. Pandav R. M.
Thombare Yogesh Ramdas, Shinde Amol Bhausaheb, Jadhav Aditya Chandrakant, Aher Lalit Rajendra and Prof. Pandav R. M.. "Intelligent Route Recommendations Systems." International Journal for Scientific Research and Development 7.2 (2019): 731-734. Biswajit Majumdar. "Quality of Life (A Micro Study)." International Journal for Scientific Research and Development 7.2 (2019): 735-737. Jitendra Sahu and Vasundhara Shukla. "Field Oriented Control of Permanent Magnet Synchronous Motor." International Journal for Scientific Research and Development 7.2 (2019): 738-743. Nikhil Jagdish Bashetty, Shubham Pimparkar, Anish Barse and Sanket Maske. "Development of Dual End Drill Machine." International Journal for Scientific Research and Development 7.2 (2019): 744-747. Soniya Sanjay Kokil, Snehal Deepak Bhosale, More Priyanka Arjun and M. S. Mathpati. "IoT Based Notice Board." International Journal for Scientific Research and Development 7.2 (2019): 748-750. Kumbhar Suraj Hemant, Amkar Krishna Subhash, Jadyar Prathamesh Chandrakant, Dhumal Amit Gundopant and Prof. S. J. Nimankar. "A Review on Material Handling Equipment." International Journal for Scientific Research and Development 7.2 (2019): 751-753. K. Damodar, Y. Siva Ram Kumar, L. Prudhvi Raj, M. Ajay Krishna and K. Vasantha. "Study on the Performance of Concrete using Sugarcane Bagasse Ash and Coal Bottom Ash." International Journal for Scientific Research and Development 7.2 (2019): 754-757. Archit Mehta, Unnati Bariya and Devyani Patel. "Automated Car System." International Journal for Scientific Research and Development 7.2 (2019): 758-759. -Makwana Meena R.	; Koradiya Tasleem I.; Solanki Ankita K.; Makwana Namrata A.; Savliya Bhavna V.
Makwana Meena R., Koradiya Tasleem I., Solanki Ankita K., Makwana Namrata A. and Savliya Bhavna V.. "Control of Industrial Boiler with Temperature Controller and Motor Speed Control using AC Drive." International Journal for Scientific Research and Development 7.2 (2019): 760-764.